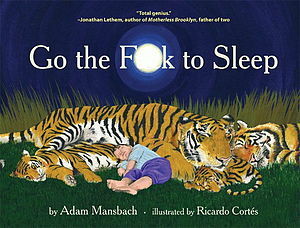 When Adam Mansbach’s (the author of this book) daughter Vivien was 2 years old, she would take up to two hours to fall asleep. Thoroughly knackered, Mansbach jokingly posted a note on his Facebook page with the status, “Look out for my forthcoming children’s book, Go the — to Sleep“. Friends of Mansbach responded enthusiastically, so he began writing what was at first only a hypothetical book. Mansbach had the illustrations for the picture book done by a friend, illustrator Ricardo Cortés and approached a book publisher by the name of Akashic Books, from New York.